Good morning - It's time for another Sweet Sunday Sketch Challenge! Here is the deal: make a card with this layout and use Mr. Linky down at the end of my post to enter your card. On Thursday at 10 PM (Mountain Time), I'll randomly select one card to feature on my blog. So, as long as your card is linked in the Mr. Linky box by 10 PM Thursday, your card will be in the drawing. Be sure to link directly to the blog post or gallery image which features your card. You may post a picture of the sketch on your blog, but please save the image to your computer first. Use the keyword SSSC35 if you plan to post your card in an online gallery. I have some EXCITING news for you! 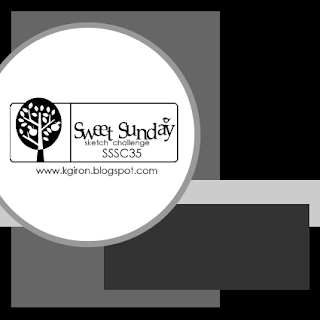 This week, the Sweet Sunday Sketch Challenge has been sponsored by Clear & Simple Stamps!! What does this mean? Well, you have a chance to win the stamp set of your choice from September's Clear & Simple Stamps release! All you need to do to enter is follow the instructions above and I'll choose one random winner on Thursday night. Do you need to use Clear & Simple Stamps to win? No, but if you have them, why not ink them up for this fun occasion? Clear and Simple Stamps is a clear polymer stamp company based out of Maryland. Our stamps are designed to produce fun and inspiring stamp images that give you the creative freedom to be a true stamping diva! Our signature line - Simple Darlings™ is dedicated to represent all types of fabulous women doing those everyday things we all love to do. Whether it is traveling, shopping, gardening or just spending time with friends, each Simple Darling is truly a masterpiece and you will want to stamp with them all. We provide high-quality, repositionable, clear polymer stamps. Our concept, pardon the pun, is clear and simple stamping. We have a growing collection of fun stamps that we hope you will find unique and inspiring to work with. We design all of our stamps in-house, and cannot wait to see your fabulous creations – or what we like to call your “divalicious style” shine through when creating with Clear and Simple Stamps! For my sample today I'm using the set, Gratitude. I love this little flower set and jumped at the chance to use it today. I stamped the stems in Old Olive ink and then I colored the flowers in with Copic markers, added a little Crystal Effects to the centers, and popped them up with stampin' dimensionals. Now it is your turn! Have fun and good luck! Oh, gorgeous card. Great sketch Karen. Your card is absolutely lovely Karen! Love all the blues and great mix of DP. Simply adorable! We are thrilled to sponsor this week, and wish all good luck with the challenge. Its a fun one - enjoy! GORGEOUS card Karen!! It's in my favorite colors and the details and LO are just perfect. Love it!! Karen, this card is so pretty. I really like the colors you used. Another GORGEOUS card of yours, awww!!! Gorgeous card Karen, love the sketch too!!!! Great Karen, love the 3D flowers! Such a beautiful card....wonderful colours. your card is stunning karen....I am going to do my best to play along this week....I luv square cards so I will be using this over and over...thanks! Love your sketches! Now that school is back in and I have some "mommy time" hope to be able to do your sketch as they are lovely. Great sketch and gorgeous example but for some reason I couldn't get it quite right. I thought I wasn't going to make the deadline but I got there eventually. Thank you for challenging me! love the sketch Karen as always! I'm late but I liked this sketch so much I wanted to give it a try.